Far too long have the recreational needs of students living on university campuses have been left up to their own imagination. Without cars to get to the gym or a pre-collegiate solidified interest in rock climbing, their options were to walk around the quad or join a sports team. No wonder the freshman 15 was a thing; school back then was all work and no play! It was even worse for people who studied in the South, where there was no reprieve from the blazing August heat, except maybe a tree. Finally, schools have gotten wise and tried to make the campus a place you would actually want to be. Some schools have gotten flack for their choice to add a lazy river or a giant winding waterslide to their list of options for student on-campus activities. Who needs a trampoline in the middle of an Olympic-sized swimming pool, or a zip line over the deep-end? School should be hard work and stress punctuated by boredom. What are students paying for, after all? The schools that have incorporated these features into their campus recreation centers might respond, who doesn’t need these things? Brain science is showing that young people who are more physically active retain more information, have better mental health, and manage their time better. After a long day of reading and lectures, being able to meet up with friends to watch Jaws projected on a huge screen while I hang out in a hot tub in the cool evening breeze would definitely inspire me to get up and do it all over again. How Does College Consensus Rank School Waterparks? The institutions included in the Top 10 Best Colleges with Waterparks are ranked according to their College Consensus Score. College Consensus takes into account both published rankings and student reviews. The list was developed from colleges and universities that have received recognition for their innovative design and ability to think outside the box in the name of student fun. Some seem to be the most dynamic, some look the most accessible, and some just look like great fun. Admittedly, this list is a bit subjective. Luckily what matters most is the academics of the institution, which is really what college is all about – not a rock climbing wall next to an indoor, heated swimming pool. But isn’t life better with both? As far as we’re concerned, absolutely. The University of Colorado in Boulder opened in response to the westward expansion of the middle 1800’s. Before Colorado was even a state, the legacy of this public research school began. Now, CU Boulder is creating opportunities for more than 33 thousand students at all levels of study. They operate a $300 million research budget and regularly rank in the top 100 schools overall, according to the U.S. News and World Report. At CU Boulder, they take sustainability very seriously and have been the innovators in several on-campus initiatives that have encouraged other schools to do the same. They introduced the first zero-waste, net-zero water, and net-zero energy athletics program in the nation. This includes the first fully wind- and solar-powered football stadium in the country, as well as rainwater collection for sports team fields, and fully compostable products from cups sold at games to bags that field fertilizer comes in. It is almost as though CU Boulder looks for things to create sustainably, including their 2011, 3,500 square foot, LEED Platinum certified recreation center. The school’s five pools are also an essential part of this certification, as heat waste from the hockey team’s ice rink, is distributed through a recovery loop and used to warm the center’s four indoor pools. The downhill movement of the water itself generates the energy used to pump it from place to place, and the excess heat is pumped to the large outdoor pool. They do not sacrifice style for substance, however, as the outdoor pool, complete with water basketball and volleyball courts, is shaped like the school’s mascot, the buffalo. It was the first of its kind in the logo department as well. The University of Alabama was founded in 1820, making it the oldest college or university in the state. As such, it has played a pivotal role in all major political events in the state in the 19th and 20th centuries. It is also the largest school in the state and is the flagship institution of the three-university Alabama System. The last 120 years have been some of the tremendous growth for this well-seasoned institution. They have added 13 academic schools to serve their growing population of 38,500 students in that time. The U.S. News and World Report regularly ranks Alabama in the top 50 schools in the country overall. Along with the accommodations necessary to account for the steadily growing enrollment, Bama has also done something extra. In a move that prioritizes both students’ fun and physical health, they built a comprehensive Aquatic Center complete with a 25-foot tall water slide. It is also home to the University of Alabama Swimming and Diving team, so as for the requisite Olympic pool and diving platform: check and check. The indoor, heated eight-lane pool is twenty-five yards long and is available in the morning and evenings for recreation swim. The Aquatic Center also has a 3,000 sq.ft weight room with free weights for students to pump iron before or after crushing their butterfly stroke. In the Alabama heat, hanging out in the pool may be just the ticket after a hard day of classes and studying. Louisiana State University is a large public university located in Baton Rouge, right in the middle of the state. Their history spans back to the mid-1800’s when it opened as a military academy, with then-Colonel William Tecumseh Sherman as its president. The start of the U.S. Civil war took the attention of Sherman to become one of the Union Army’s greatest commanders. It also took away the attention of LSU to close down and offer cadets to the Confederate Army. We have moved on as a nation, and LSU has as a school, briefly becoming a seminary, and then the public research facility it is today. They operate 15 colleges and schools and educate nearly 32 thousand students each year. The student recreation department at LSU raised some eyebrows in 2017 after announcing an $85 million campus leisure project. The project included a regulation-sized basketball court inside the pool, several submerged lounge chairs, and indoor/outdoor lap lanes and diving boards. The most popular feature is a 3.5-foot deep “leisure river” that spells out the letters L-S-U, from above. The rushing waters can act as a fun way to float around the pool, or as a resistance pool during certain hours for those who are looking for a more challenging swim. There are giant inflatable water trampolines and floating water logs for running. Students can check out equipment like inner tubes and basketballs, and swim classes are available to students as well. The University of Missouri is a public university located in Columbia, MO, smack in between St. Louis and Kansas City. They were founded in 1839 and were the first public college west of the Mississippi River. The school is best known for their dominant participation in the Southeastern Athletic Conference in 15 sports, as the Mizzou Tigers. MU also operates the University of Missouri Health Care system, which contributes four teaching hospitals to the state. They serve more than 30 thousand students per year on their 1,200-acre campus, and through Mizzou Online. They are often ranked in the top 100 overall schools by the U.S. News and World Report. The MizzouRec aquatic facilities consist of four states of the art pools, the 50M Pool, the Diving Well, the Tiger Grotto, and what’s called Truman’s Pond. The aquatics facility and the 50M pool and Diving Well specifically is home to the Mizzou Swimming and Diving team. Students are welcome to play, relax, and get fit there as well. The Grotto is an indoor, underwater LED lit pool that features a zero-depth entry and a high-powered vortex, lazy river and waterfall. The MizzouRec aquatics team is particularly proud of the large hot tub, sauna, and steam room next to the Grotto, for students to loosen up after a hard workout. Truman’s Pond is a smaller outdoor pool just for recreation. Iowa State University sits in the heart of Ames, Iowa, about 30 miles north of Des Moines. It is a public research university and the largest school in the state. It is also the flagship school of the 3-university Iowa system and the largest school in the big 12 athletic conference. UI is the most significant attractor and employer in the city, making Ames a destination spot for students and fans of the 16 varsity teams, or those seeking the expert medical care of the excellent university hospitals and clinics. Iowa State has a remarkable legacy in innovation, contributing the laboratory space that invented the Manhattan Project’s Atomic Bomb in 1942, as well as being the birthplace of the first electronic digital computer in the same year. The Campus Recreation & Wellness Center (CRWC) at Iowa State was built in 2010 and is still one of the best overall university rec centers in the Midwest. The aquatic center at this massive complex combines includes fitness components, like the 50-meter competitive swimming pool and 18-ft deep diving well with 5 and 10-meter diving boards. They also have the Leisure Pool, with a sizeable 25-person spa. Finally, Iowa puts the two together in a lazy river and the Vortex, a swirling water chamber for resistance training or dizzying fun. The Vortex strength training class offers group fitness for students or community members who become members. Colorado State University in Fort Collins is the flagship school of the three-campus Colorado State University System. They currently serve over 33 thousand students in 150 programs of study. They feature eight colleges, including the unique Warner College of Natural Resources, which leads in the country in many areas of research on all things sustainability and human/Earth resource collaboration. The university is not scared to try new things with research and routinely ranks in the top of all American Universities in research expenditures. The researchers at CSU have developed what is called Supercluster Research Centers, attracting researchers across disciplines to collaborate on new ways of seeing a research topic. They have developed Superclusters in Infectious Disease and Cancer Research and Treatment. Most recently, they added a Clean Energy Supercluster to join the others. Solving some of the Earth’s most significant questions is not the only thing that CSU does exceptionally well. After all of that hard work, students at CSU are also able to play! The student recreation center pool features a current channel that allows for floating or resistance swimming and four 25-yard lap lanes. A zero-depth entry with sprayers is one of the many accessibility features, along with gender-inclusive changing rooms for all students and guests. For the sportier pool-goers, the water volleyball and basketball area can get quite rowdy, in stark contrast to the 40-person spa, steam room, and sauna. 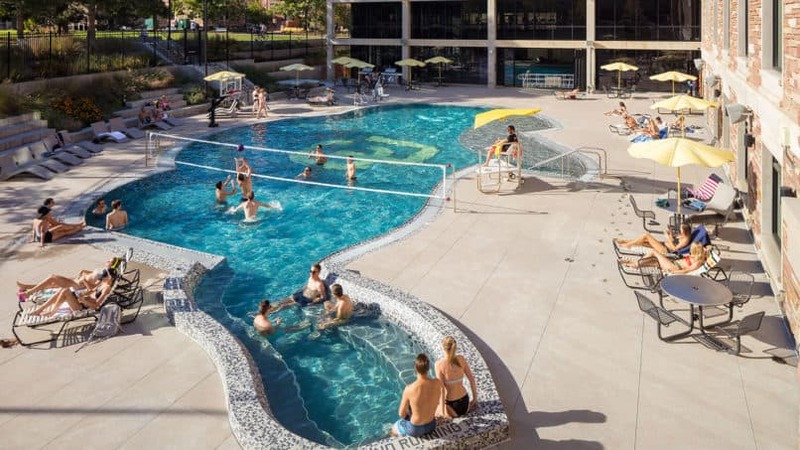 Arguably the best part of being at the aquatic center, if not of being a student at CSU itself, is the 10-foot climbing wall perched above a deep water pool, complete with a cascading waterfall. It does not get much cooler than that. Texas Tech University is the whole name of the school in Lubbock. When it was founded in 1923, it went by Texas Technological College, hence the unique shortened “Tech” in the current name. It is the flagship campus of the Texas Tech University system that includes one other college and two university health centers. The more than 37 thousand students participate in 10 varsity sports as the Texas Tech Red Raiders and Lady Raiders. Texas Tech is one of 115 universities that conducts the highest amount of research in the country, including in the areas of medical, aeronautics, and agricultural science. Perhaps most notably, a 2008 team from TTU developed a potential cure for HIV. All the hard work in research and athletics calls for an equally hard-working aquatic recreation center. Luckily, Texas Tech follows through. Like most essentially Texas things, the aquatic recreation center at TTU it is indeed Texas-sized. The Texas Tech Student Leisure Pool was completed in May of 2009 and is currently the most extensive leisure pool on a college campus in the United States. Students can choose from the 645 foot long lazy river, the 25 people hot tub, or the cascading water wet deck with partially submerged lounge chairs, if they are feeling like lounging. For more active features, they can launch off of the 10-foot drop slide, workout in the eight-lane lap pool, or play in the 4-lane free play and fitness pool. The indoor pool features lap swimming, water basketball and volleyball, and fitness classes. Students can access wifi from anywhere in the facility and can charge snacks at the snack bar to their student account. The University of Alabama at Birmingham was founded in 1936 as an extension of the University of Alabama, over in Tuscaloosa. Thirty years later it became a four year school and independent in 1969. UAB offers learners 51 bachelor’s degree programs, 46 master’s degree programs, and 36 doctoral programs from one college (arts and sciences), nine schools, a Graduate School, and the Division of General Studies. The university serves more than 20 thousand students each year, through both on-campus, and excellent distance learning programs. They ranked 25th nationally in 2016 in funding from the NIH, where research grants totaled more than $238 million. The UAB Campus Rec Aquatics Center is a significant feature of recreation and physical fitness for students at UAB. The indoor pool complex features four 25-yard long swim lanes, dive boards, and an oversized hot tub. The aquatic facility also has what they call a vortex, with pressurized water jets, which can be used as resistance training, body boarding, or good old-fashioned lazy river-style floating. The aquatic center values accessibility as the main feature for students, including a long ramp entrance into the pool itself and a chairlift. Students can check out the water basketball hoops to set poolside for a game with friends. If that is not fun enough, see how long you can hang onto the zip line into the deep end. The roots of this public research university date back to 1905. At that time it was the small teacher’s college for the quickly growing Springfield, Missouri area. A few more than 500 students packed the one-building college at the time. Since then, enrollment is up to over 23 thousand students participating in nine different schools, including a graduate school. Since 1995, Missouri State has prioritized a mission in a public affairs-focused education model. This means that students are trained to lead ethically, learn culturally and engage communally as a theme in their education. Students’ educational needs come first at this large school. It is routinely ranked in the top 75 Universities in the Midwest by the U.S. News and World Report. There are dedicated centers for student’s interest in Agriculture, Performing Arts, Design, and more. The physical needs of students’ also come first, as seen in the investment in the Foster Recreation Center. The Aquatics center offers all people ways to get in the game, with accessibility for people with disabilities in mind. There are dozens of programs for water fitness at Foster and even athletic clubs for those who love the competition. Paddleboard classes take place in the 7,000 square foot pool. Log Rolling nights offer students a way to get in shape and have fun with friends at the same time. A favorite feature of the pool is the current, which provides lap swimmers and fitness classes resistance to swim against, like a current. When swim class is not in session, it acts as a lazy river, winding students around the pool as they relax in the 85-degree water. An accessible hot tub, sauna, and pool lift mean that everyone can take advantage of these great features. At night, students can take advantage of the 100-foot projection screen and screen their favorite movies while never leaving the pool.